Money and productivity don’t define us; love does. Credit: Flickr/Jeremy Hunsinger. CC BY 2.0. This summer, I spoke with a therapist about my issues with workaholism and compulsive saving. I was working 17 hours a day, making ten times the money I needed to survive, and depriving myself of doctors’ appointments, food, and other necessities out of fear of seeing the number in my bank account go down. “How do I stop?” I asked. And I didn’t decide that. I learned that somewhere – namely, from toxic capitalist values. When I talk about capitalism, I’m not talking about the economic system. It may be possible to live somewhere with a capitalist economy and see yourself as a valuable human being regardless of your wealth or your job. But it does make it difficult, especially in places like the US, where one’s rung on the economic ladder determines how much respect they’re afforded. We live in a society where many don’t consider unemployed people worthy of basic life necessities, where poor or working class people are deemed unproductive and incompetent, and where we have so little respect for people without a traditional job that our government requires no paid family leave. Through this culture, we internalize the idea that people with more “impressive” jobs and money are superior. Paradoxically, Americans also learn that everyone is equal. And we often try to apply this value to other people, at least on the surface. But the belief that people are unequal still comes out in our subconscious behaviors – and in our attitudes toward ourselves. Toxic capitalism teaches us to view ourselves as machines and calculate our worth based on how much we produce, whether that’s in money or work output. I’m not saying we’re powerless to change our lifestyles for the sake of our mental health. What I am saying is that we’re not the ones who decided our worth lay in our productivity. Other people teach us this lesson – it’s part of our everyday norms, even as this belief erodes at our well being and humanity. Here are just a few behaviors that encourage destructive behaviors by promoting toxic capitalist values. When we’re growing up, authority figures shower us with praise for good grades and excellence in extracurriculars. But we’re rarely told we’re valuable or special or loved even if all that goes away. The way to get gold stars from teachers is to ace tests. The way to get high fives or special meals from our parents may be to win sports games or awards. In short, we learn that the way to make adults like us and love us is to achieve. And when we’re kids, we need adults to like and love us. We depend on them to survive. We’ll do whatever it takes to gain their approval. As adults, we may not need our elders’ care anymore. But our brains mainly develop when we’re kids, and the neural pathways leading from achievement to reward are deeply ingrained, like a route you move through in the woods until it’s an indented path. Parents don’t realize that when they praise kids for being smart or athletic or pretty, they’re implying that this is what makes them worthy of love. But when they don’t praise them unconditionally – outside their accomplishments or even their qualities – this is what kids conclude. Our brains, after all, are wired to detect patterns, like When I eat, I stop feeling hungry, and when I do all my homework, Mom’s nicer to me. Detecting these patterns is how we survive. It’s no wonder they’re so hard to undo once we realize they don’t serve us anymore. 2. Pushing kids, even when it takes a toll on them. Under toxic capitalism, you learn that you’re not working hard enough if you’re not in discomfort. Some of us may first learn this through sports. When I was seven, I remember seeing my eleven-year-old brother throw up during an elementary school race that my dad had trained us for. I thought, I’m not throwing up. I’m not working hard enough. Then there were the soccer games, where my dad would yell at me from the sidelines. “Come on!” he’d say angrily. It was scary. Desperate to avoid his anger, I threw my all into games, ignoring pain and cold because he’d tell me I was tough for playing in the cold and not complaining about bruises. I loved my bruises. They proved I wasn’t weak. I felt ashamed for wishing soccer games were canceled after my dad talked scornfully about the “laziness” of a classmate with the same hope. I grew up in an especially achievement-orientated culture and family, so some of this may be specific to my upbringing, which was filled with race and class privilege. But many people can probably relate to what I learned from this: Comfort meant indulgence. Comfort meant stagnation. It’s outside your comfort zone that you grow. No pain, no gain. This mentality also comes out in our approach to academics. I remember hearing my high school classmates talk about how much sleep they missed to study for tests. I felt inadequate for not making such a sacrifice. One night in college, my friend observed that she did less reading for the classes she liked most because she had this nagging feeling that it wasn’t work. We all laughed, because a lot of us also had trouble convincing ourselves that enjoyable work was worth our time. Somewhere along the way, we’d learned that pain was a sign of progress and pleasure was dangerous – because pleasure was supposedly unproductive. Under toxic capitalism, happiness is considered inherently bad, even when it’s not actually getting in the way of anything. 3. Looking down on people who get less done. Throughout our lives, we implicitly learn that it’s “stronger” and “more respectable” to spend time working than it is to spend time relaxing. This may start with our parents. My dad, for example, would criticize people who didn’t get a lot of work done or have full-time jobs with words like “ineffectual,” and praise people with “hardworking” and “disciplined” jobs. I earned both labels depending how I behaved, which made me work extra hard to get the good words. This same attitude is also in the media and in our schools. Students at my elementary school, for example, received grades for “conscientiousness” on our report cards. The “good” students were the ones who stayed in their seats and got all their work done. The “bad” ones arrived at school without their homework. I was constantly terrified of becoming one of the “bad” kids and getting in trouble. So I never did. I would work through lunch. I would work on the bus. I would work while my friends were out at night. Nobody would ever catch me being undisciplined. I recently told a friend I was scared of quitting any work because I didn’t want to be idle. “But what’s wrong with that?” he asked. I didn’t know, I realized. Being idle actually sounded fun. I wasn’t the one who decided it was wrong. Toxic capitalism and the people who perpetuated it decided that for me. In a capitalist society that says you are only as good as what you contribute, being undisciplined is akin to not being human. And people will go to extraordinary lengths to see their humanity acknowledged. 4. Praising people based on money. People love to say that they only care about people’s inner qualities, not their material possessions, and that it’s important to follow passion, not money. But even those who most vehemently declare this often promote the idea that the more money you make, the better – and that people in higher-paying jobs are succeeding at life. The Internet and bookstores are full of advice from millionaires on how to become successful, as if they’re the authorities on success. Magazines publish lists celebrating the highest-paid people in their industries. People get their own TV shows, where everyone hears what they have to say, just for being rich. As students, many of us are taught to study computer science or business to have a better shot at a large paycheck after graduation. Even the effort to get more women and people of color into STEM and leadership roles – which is generally a good thing – often teaches them to pursue these careers because they’re high-paying and prestigious, not because they love them. People, and especially women, are also taught to aspire to date doctors, lawyers, and financiers even when they’re already supporting themselves. I once literally got a high five for dating a medical resident. Obviously, we need money to survive. But our culture values money for its own sake, way beyond the point needed for survival. As someone with a stereotypically low-paying job, but above-average annual earnings, I clearly see how the way people treat me changes when they find out what I make. They go from making comments like “Well, as long as you enjoy it” to “Wow, that’s impressive,” “Could you help me with this thing I’m working on,” and even, “Do you want to speak at our school?” Suddenly, they want to know what I have to say. On the anniversary of my grandpa’s death this year, my dad told me my grandpa would be so proud of me if he were alive, given my success and my money. In fact, he often tells me he’s proud of me for being so disciplined and making so much money. Probably because my grandpa valued those things in him. And I’ll admit it: I bask in that praise. Many of us, after all, are hungry for our caregivers’ approval. People get criticized for caring how much money they make, but you know what? It’s really hard not to care about material things when they’ve been tied to your family’s love for you. The desire for love from our families is one of the strongest and most deep-seated desires. And when that’s tied to money, people who aren’t materialistic at all end up caring about money because what they really care about is love. 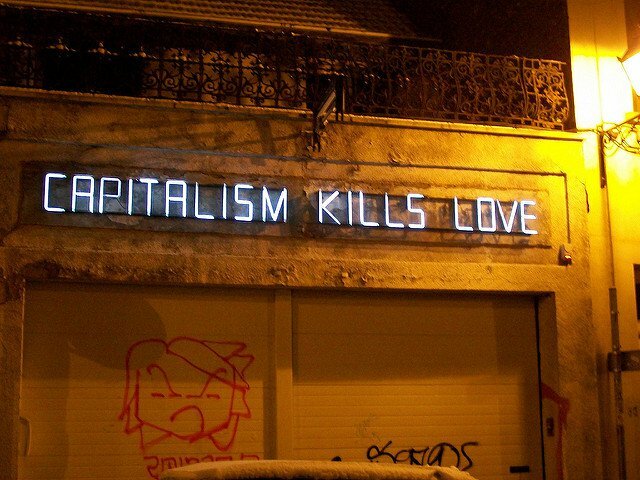 In this way, toxic capitalism equates money with love. 5. Telling people to care about their health so they can work. There’s an alarming contrast between how we treat workaholism and other addictions and mental health issues. When people suffer from alcoholism or binge eating disorder, for example, we want them to recover. When they suffer from workaholism, we brush it aside or even praise it. That’s because workaholism ostensibly increases your productivity, while many other addictions don’t. But not everyone supports my workaholic lifestyle. Many tell me to cut back. What this means, basically, is that I’m a machine that requires maintenance in order to operate. The problem is, I can operate in poor health. I’ve accomplished things while sick, sad, hungover, sleep-deprived, and more. So, should people like me just not take care of their health, since we can work without it? Or maybe – just maybe – we’re worth more than our work? Maybe we’re humans, not machines. But “We’re humans” is almost a meaningless statement under toxic capitalism, which defines a human as a living, breathing machine. I may seem like an extreme case of all the problems I’m illustrating. I grew up with a high-achieving family. I went to a Long Island prep school. I was my school valedictorian. I work more than even severe workaholics. I neglect showering, eating, leaving the house, seeing the doctor, and other basic human necessities. But I am the logical conclusion of capitalism. This is exactly what capitalism looks like. But in the process of following the rules of capitalism, I have lost my sense of worth and my belief that I deserve happiness. I have lost my humanity. Not entirely. Every once in a while, there’s that little fighting voice inside me that says I can spare a few dollars to buy my dad a birthday present or half an hour to actually pay attention to my boyfriend rather than just being in the same room as him while I work. That voice is wild, hungry, free, and immersed in the moment, not the future. It doesn’t want to achieve; it wants to be. That voice is stereotypically feminine in a world that only values the stereotypically masculine, which is one way patriarchy feeds capitalism. That voice is capitalism’s worst enemy. But it’s everything life’s about. When I’m on my deathbed, I’ll regret the times I didn’t spend time with my loved ones because I decided to work instead, not the times I turned down work to be with them. Why do I act this way? Because I’ll gain praise in the eyes of capitalism. Why do I want that? Because capitalism tells me I do. That logic is flawed. I know my parents would love me if I gave up everything. People would still admire me, and if they didn’t, I wouldn’t care, because I’d admire myself. I have little to lose and more to gain.